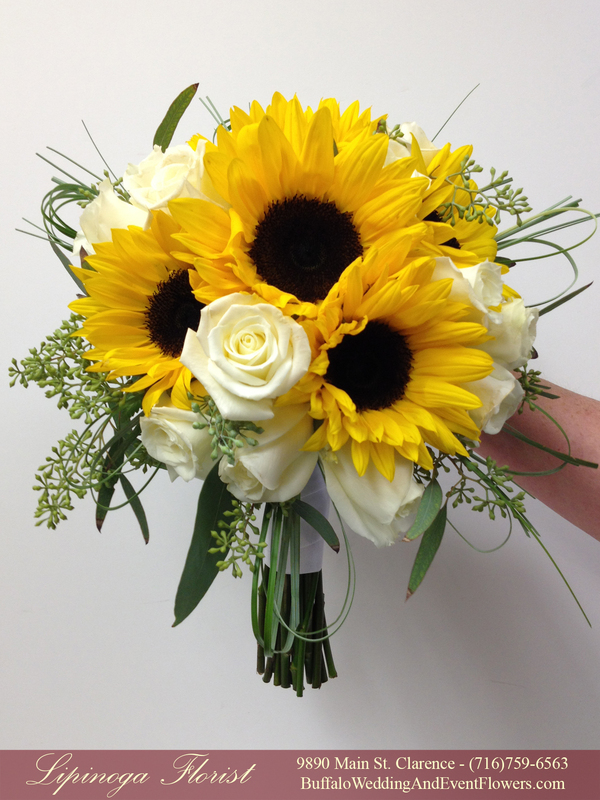 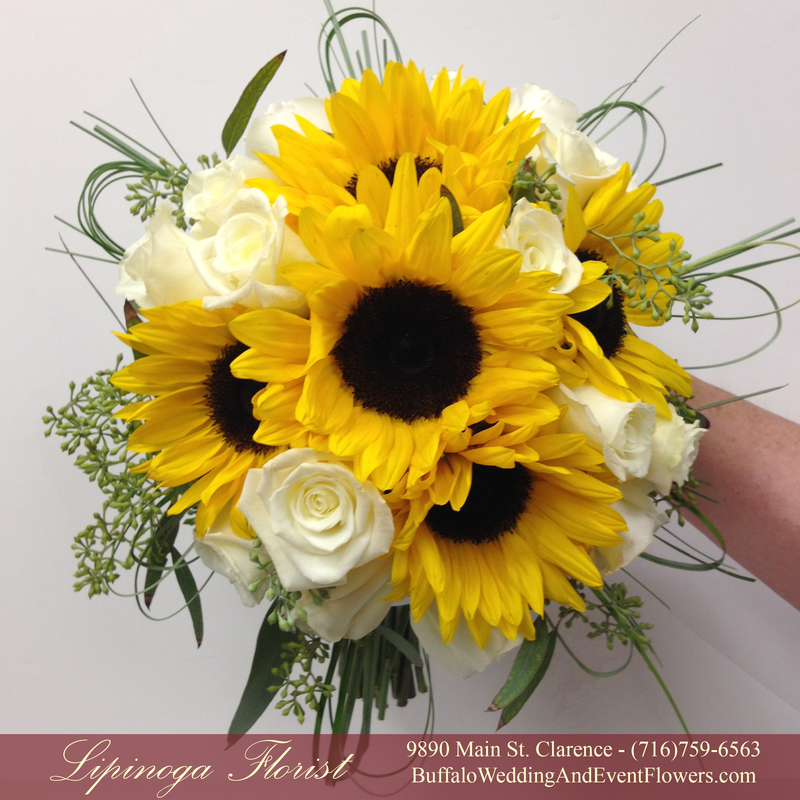 This Lipinoga Bride carried a summery bouquet of sunflowers accented by greenery and ivory roses to create a truly striking yet summery statement. 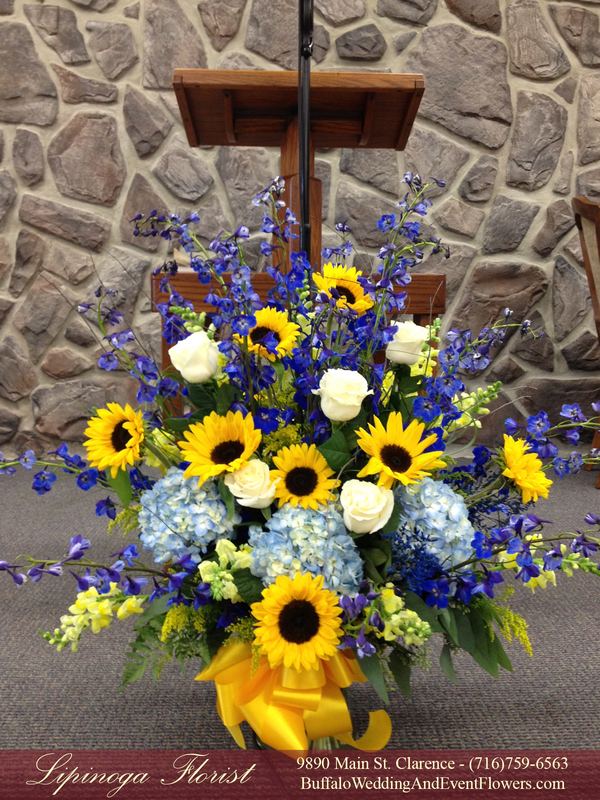 This beautiful summer wedding held at the Kingdom Hall in Angola, NY featured striking sunflowers with an accent of blue. 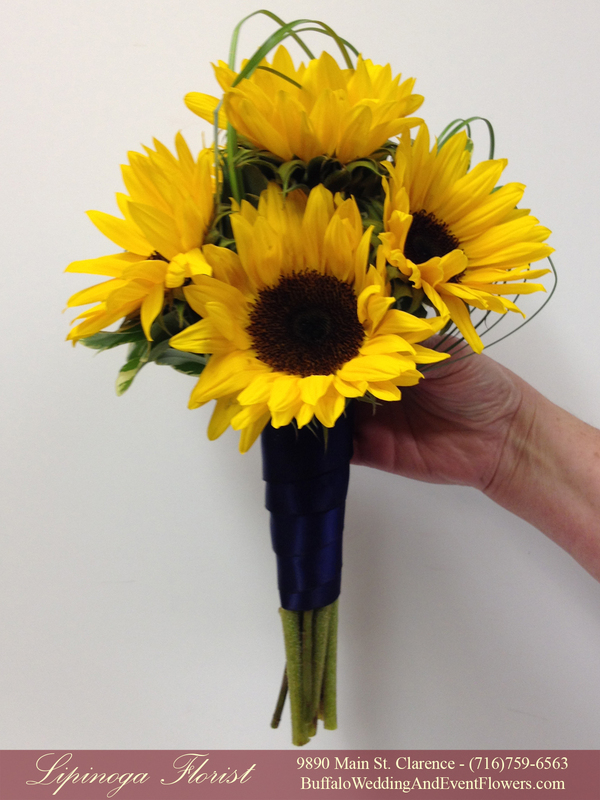 The Bridesmaids carried simple clutches of sunflowers wrapped in navy blue ribbon to complement the bridesmaids navy dresses. 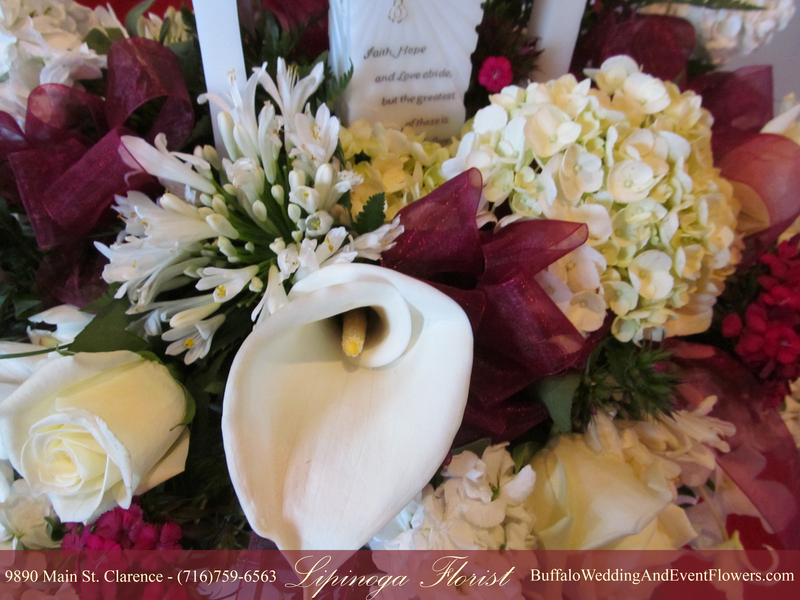 A large arrangement of blue, white and yellow flowers accented the ceremony to create a summery ambiance for this couple to tie the knot. 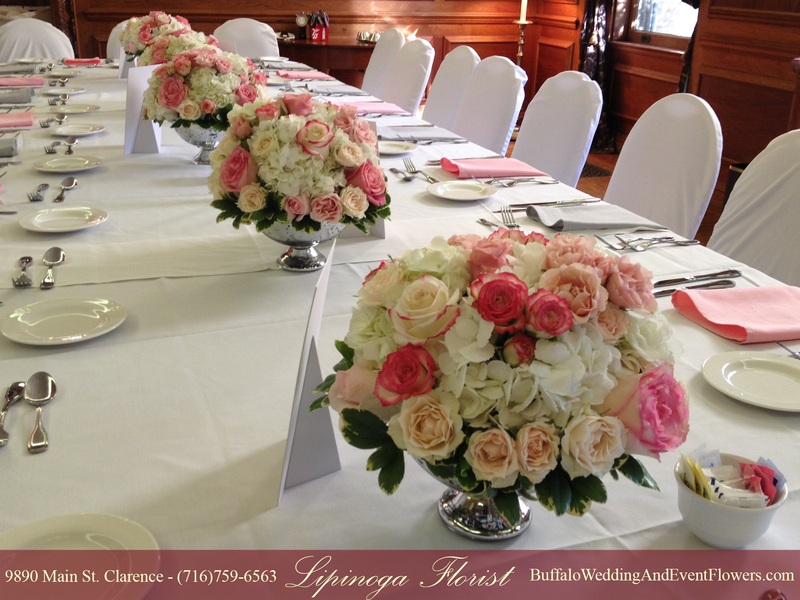 A stunning combination of pink roses and hydrangeas created a truly beautiful wedding celebration at the Butler Mansion in Buffalo, NY. 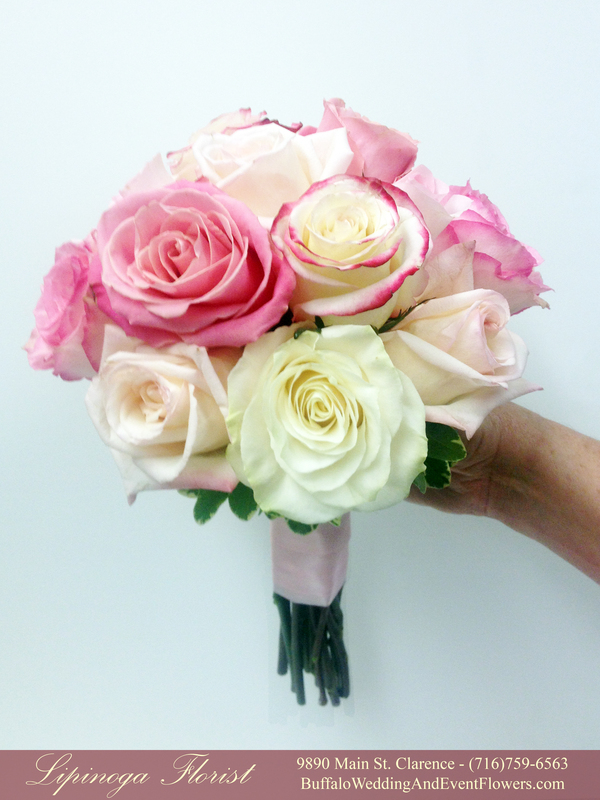 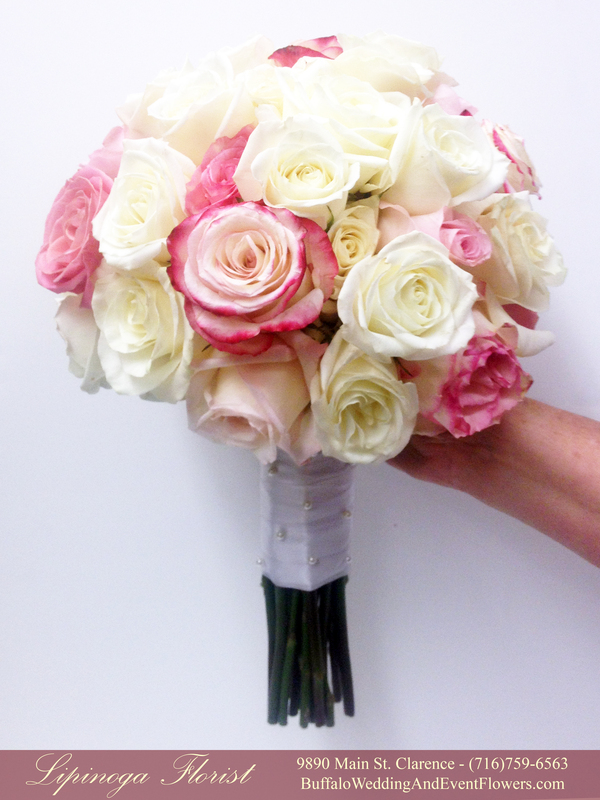 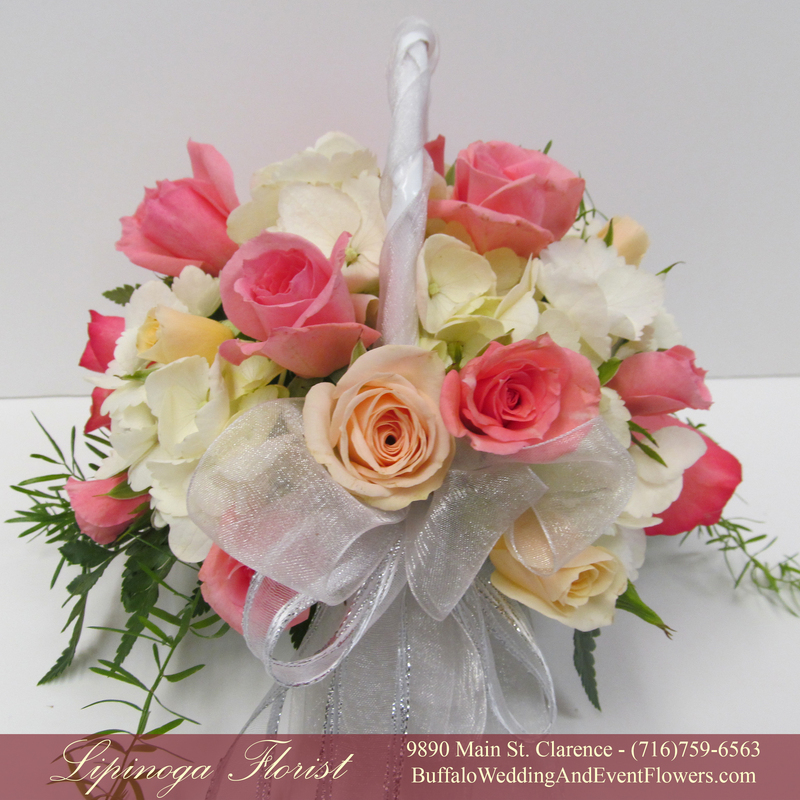 The Bride and Bridesmaids carried simple bouquets of ivory roses, mixed shades of light pink roses and white roses with a hot pink edge. 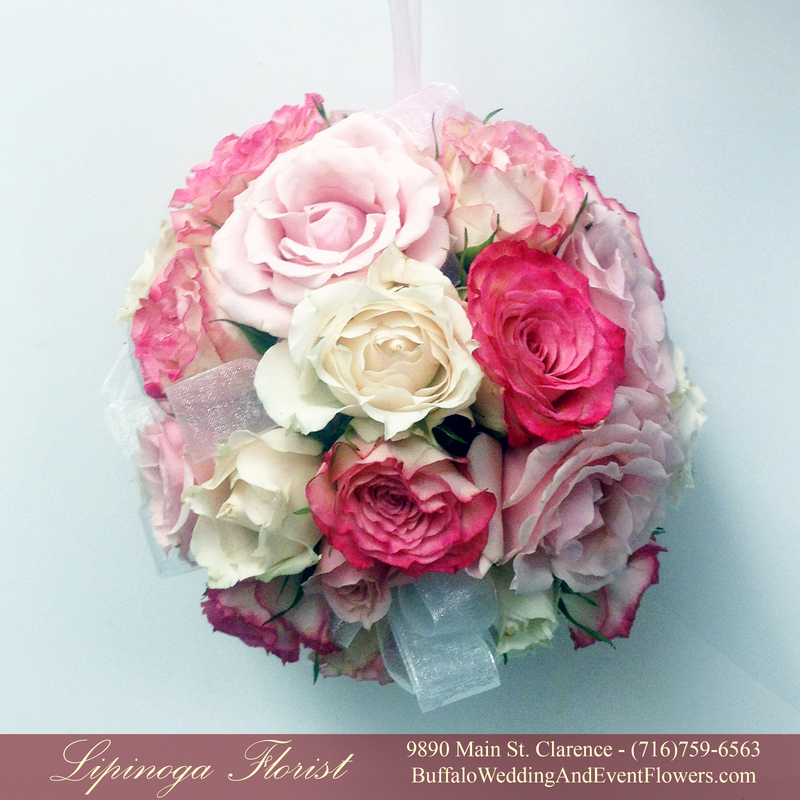 The flower girl carried a pomander ball to coordinate. 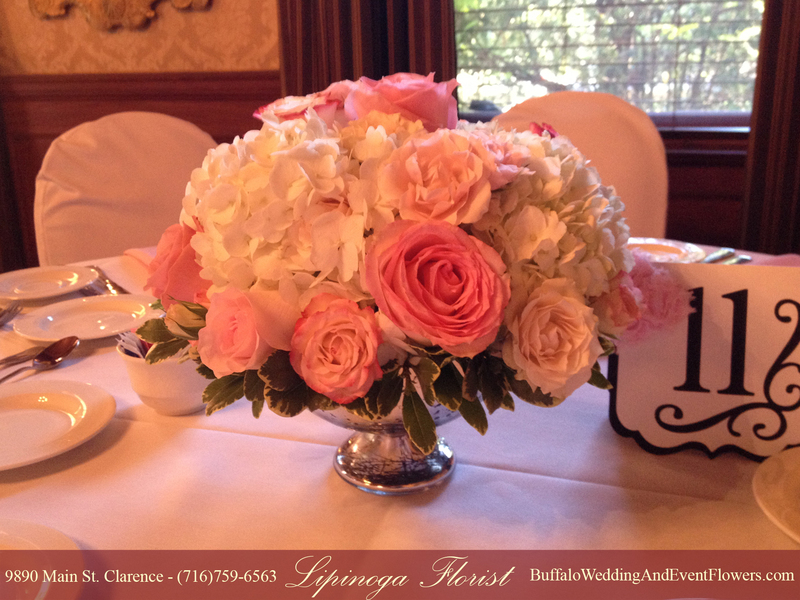 The centerpieces were arranged in mercury glass pedestal bowls. 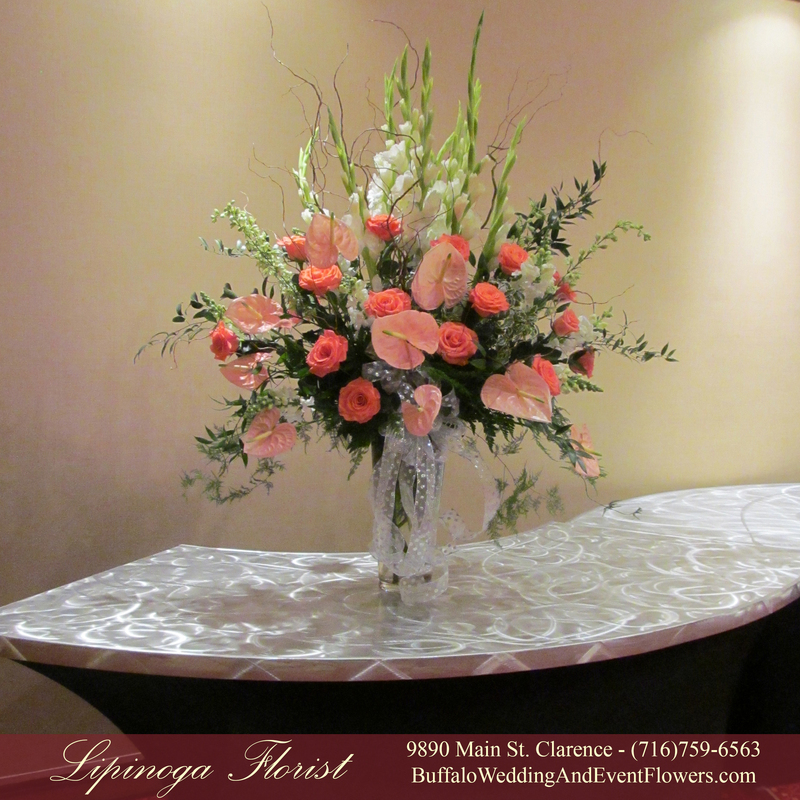 This lifted the floral arrangements slightly off the table, added a touch of shimmer and still allowed for conversation to flow easily during the wedding reception. 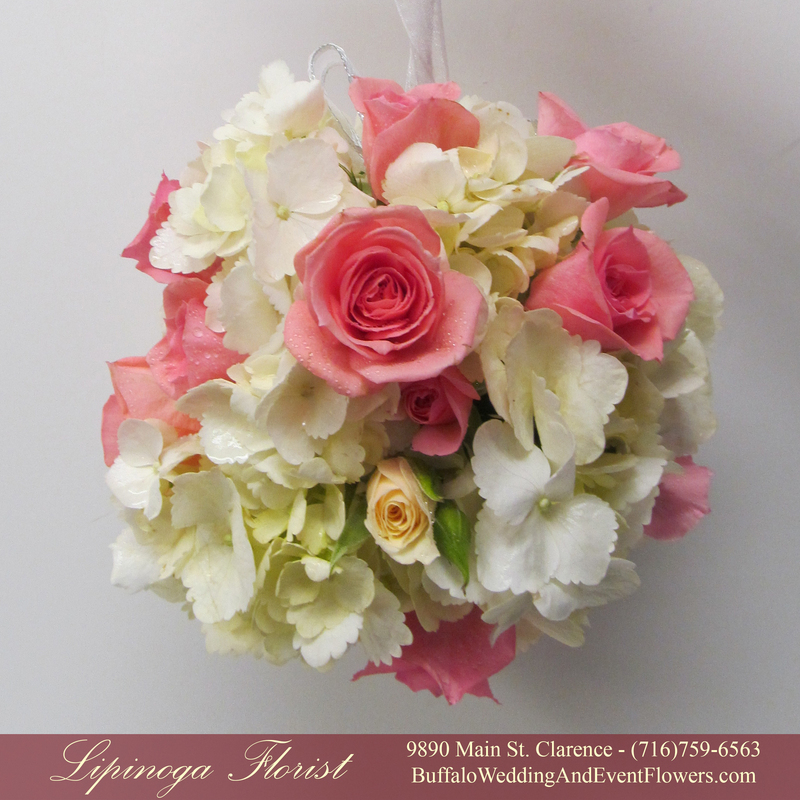 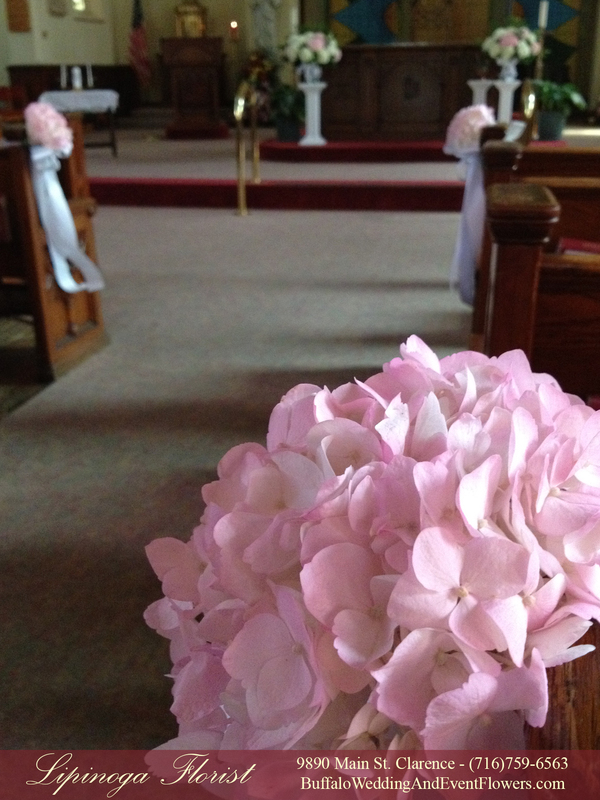 The ceremony held at Blessed Sacrament in Buffalo, NY was beautifully adorned with arrangements of hydrangeas in pink and white. 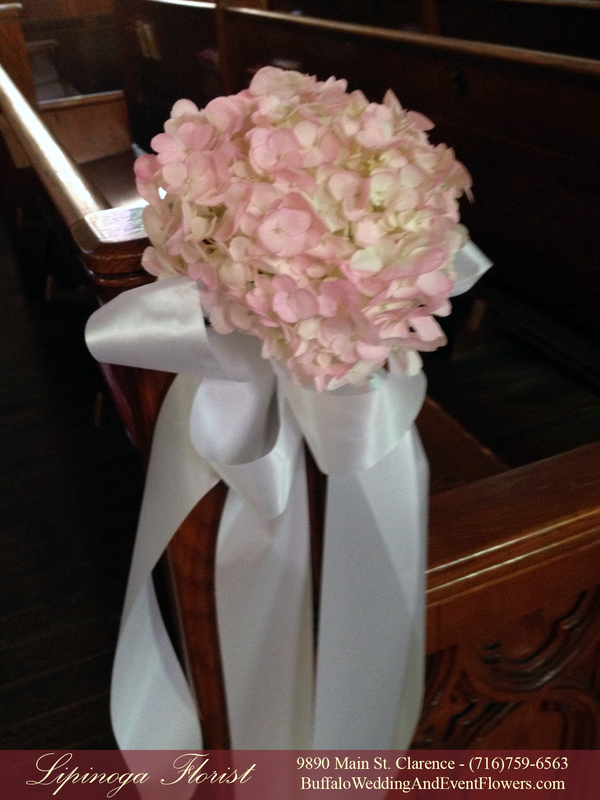 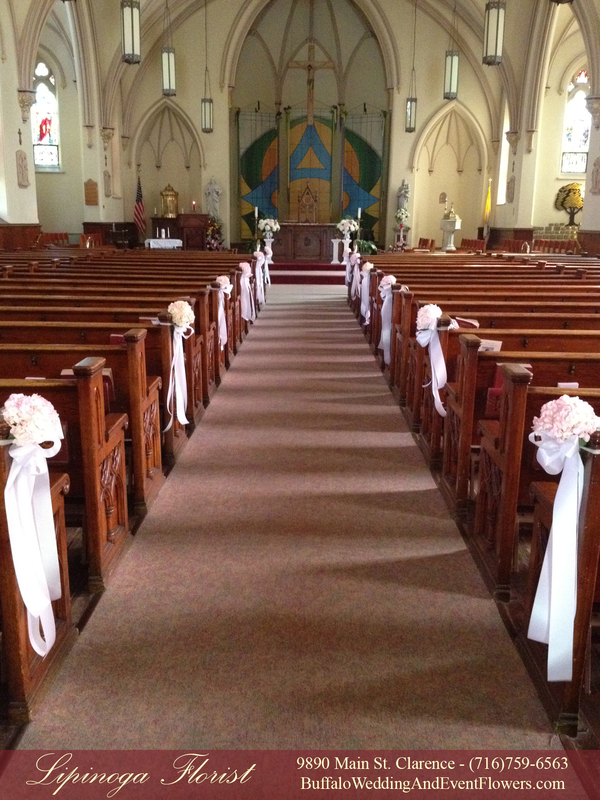 The pews were accented by a light pink hydrangea and a white satin bow. 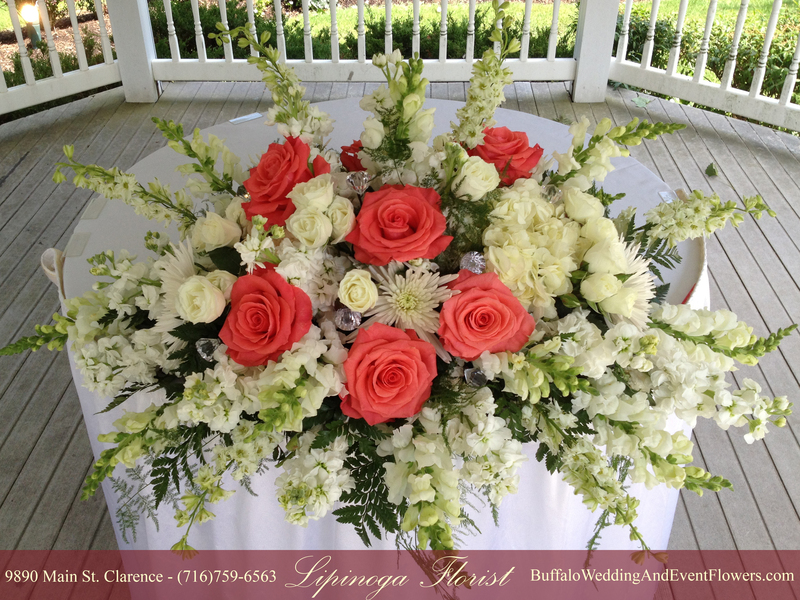 The captain’s table for the wedding party was lined with multiple centerpieces to accentuate the length and make a statement for the honored guests and the bride and groom. 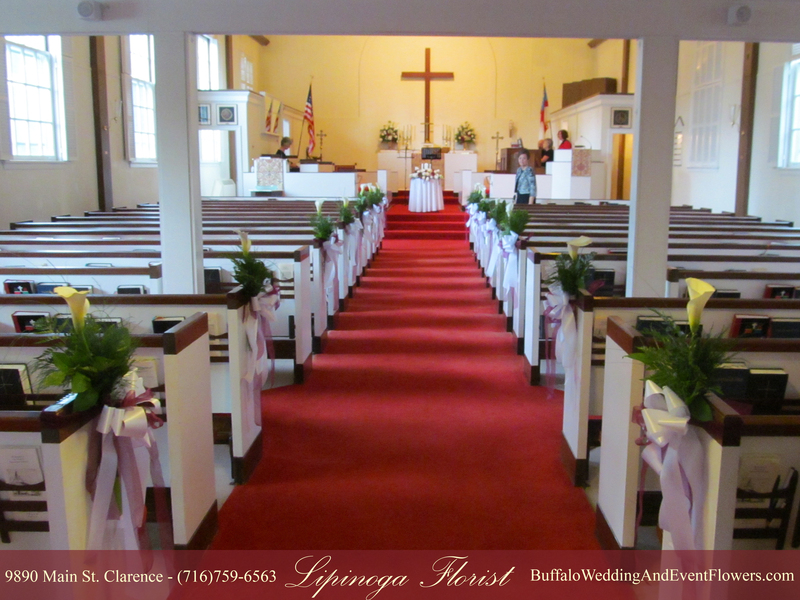 Romantic Hues of Pink and Lavender Blossoms accented by berries set the tone for a casually elegant wedding at Becker Farms in Gasport, NY. 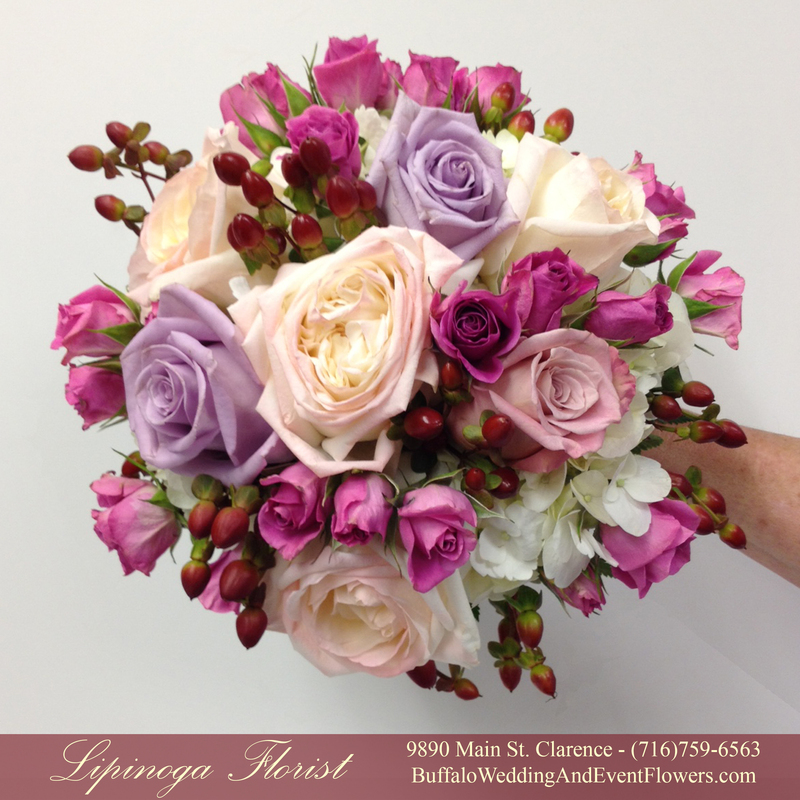 The Bridesmaids carried a combination of roses in varying shades of pink and lavender accented by hypericum berries. 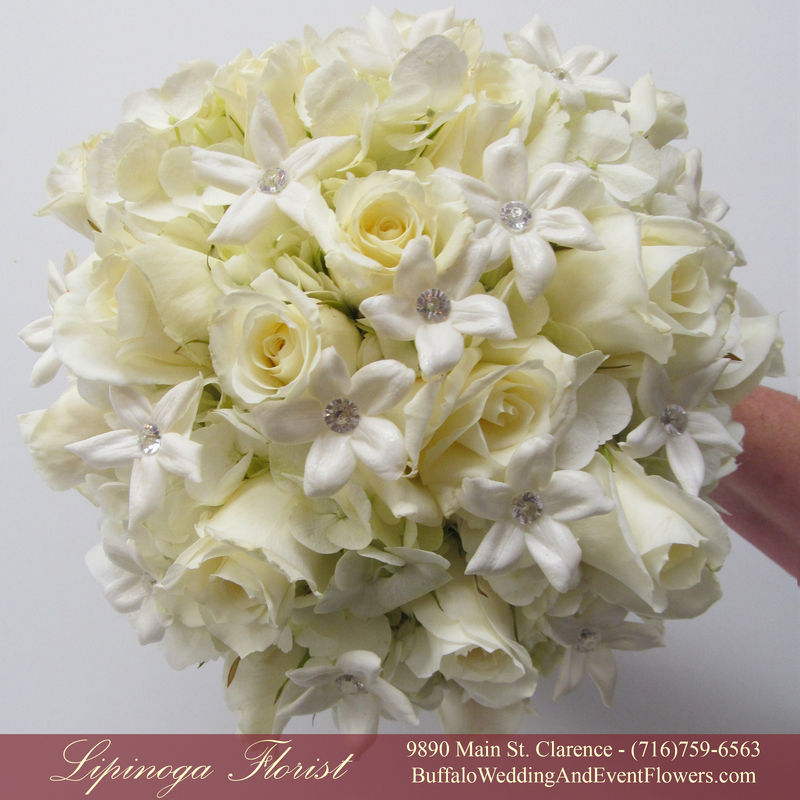 The bride carried a beautiful bouquet of all white flowers including gardenias and roses also accented by berries. 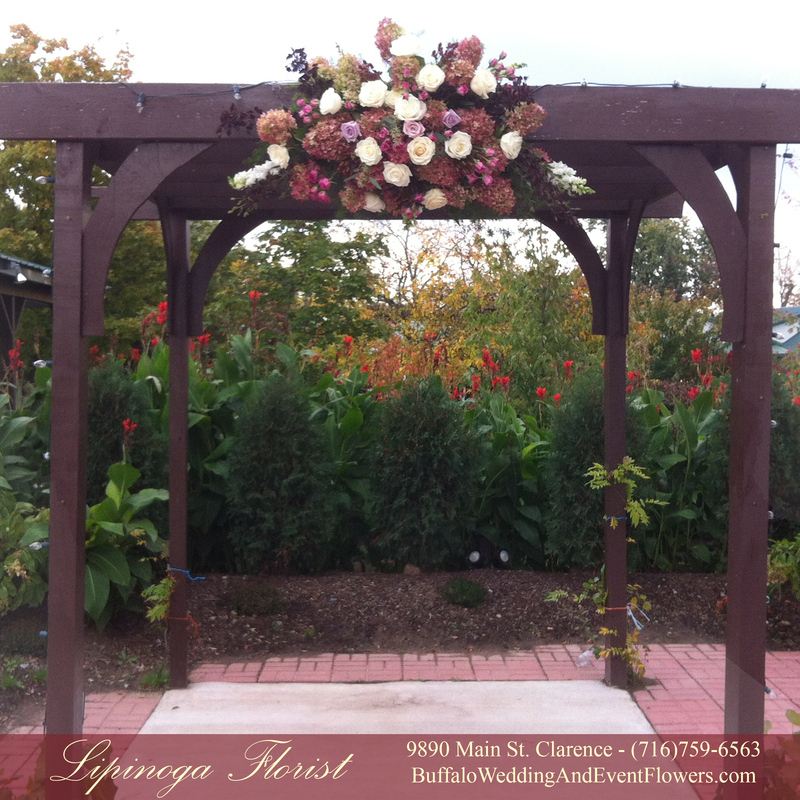 The wedding ceremony at Becker Farms featured a beautiful floral arrangement on top of the arch in the vineyard. 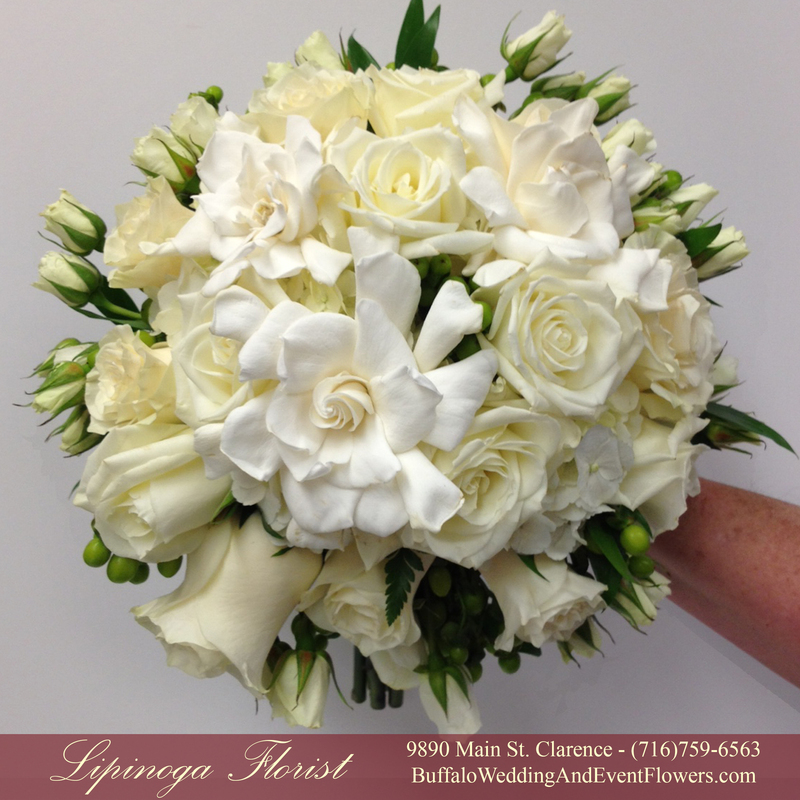 The bridal bouquet designed by Nancy of Lipinoga Florist, was and elegant cascading style including roses, stephanotis, orchids and calla lilies. 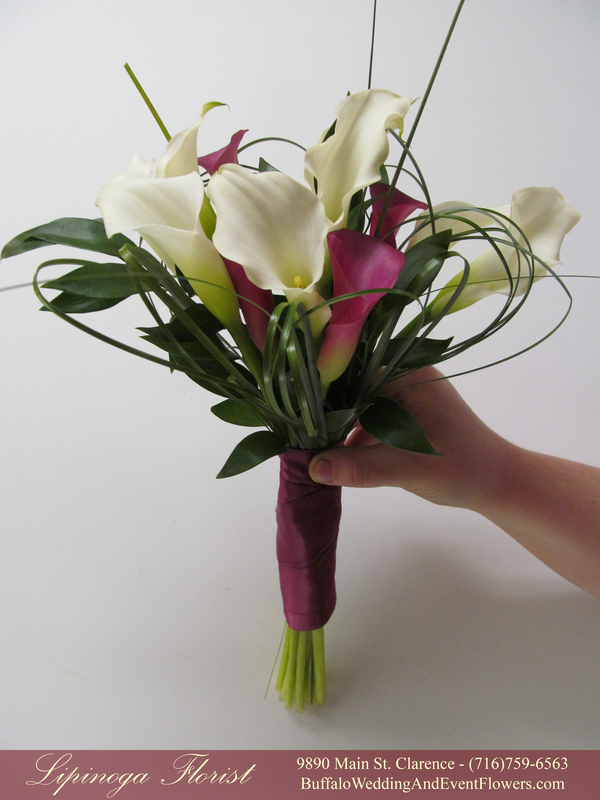 The bridesmaids carried simple clutches of miniature calla lilies. 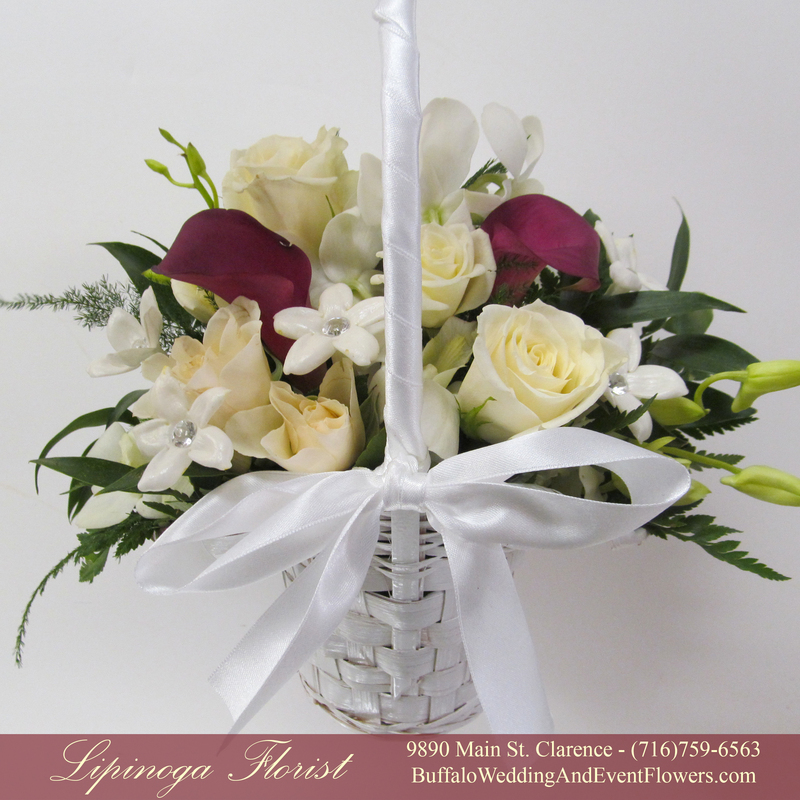 The flower girl carried an adorable white basket filled with flowers to complement the Bride’s bouquet. 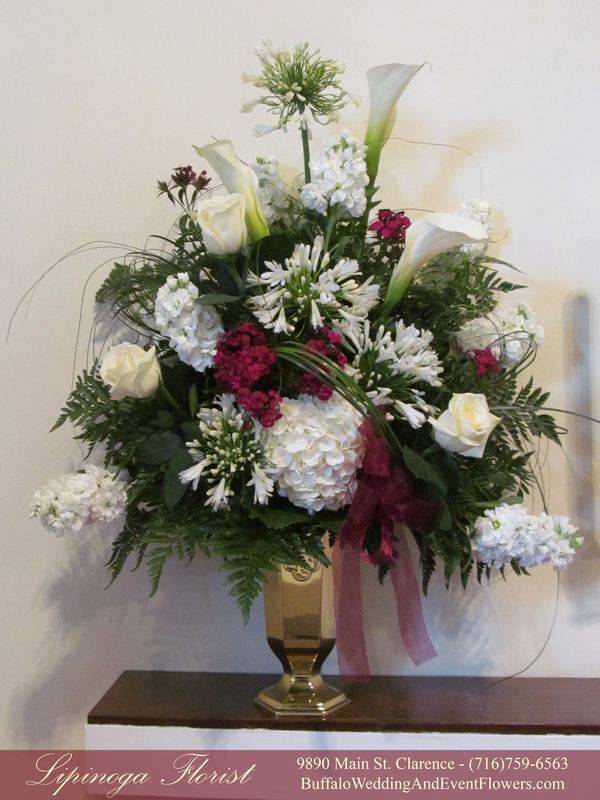 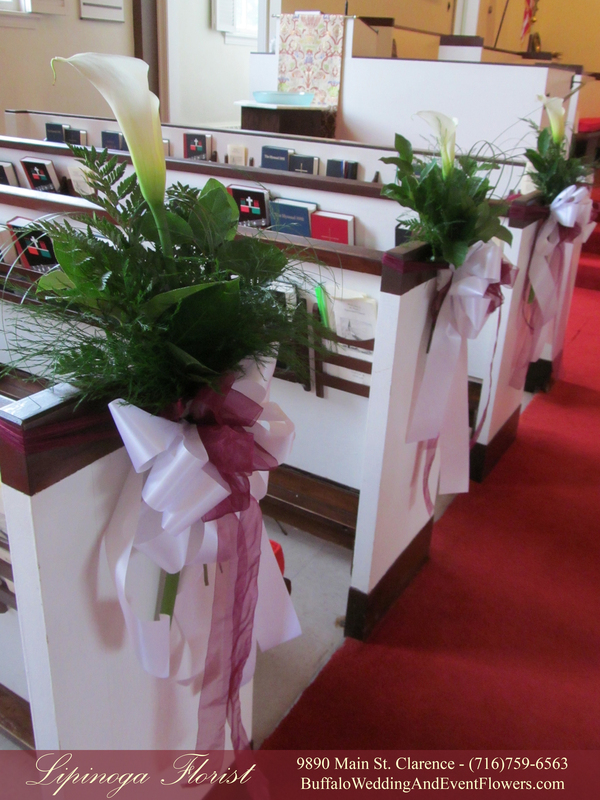 The ceremony held at St. Paul’s Episcopal Church in Harris Hill featured beautiful arrangements of calla lilies and complementary burgundy and white flowers. 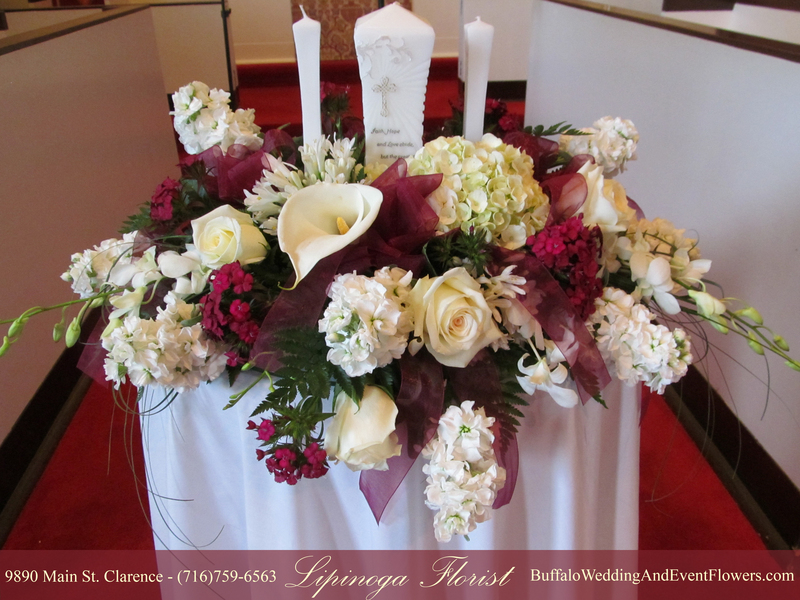 A long and low centerpiece holding the couple’s own keepsake unity candle created a beautiful focal point upon the altar. 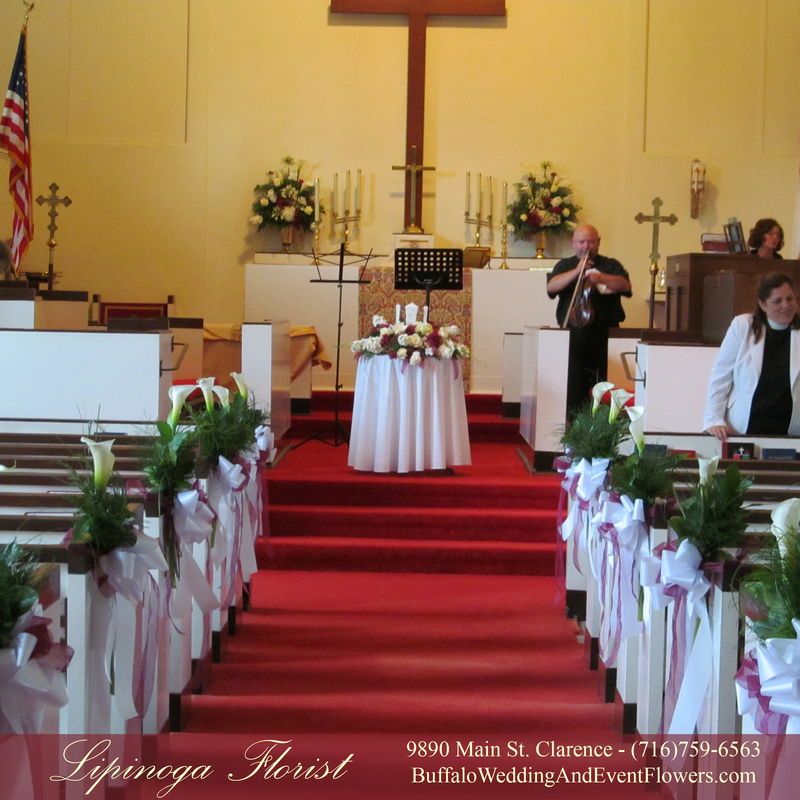 Large white calla lilies mixed with greenery and tied with a bow lined the aisle for the ceremony. 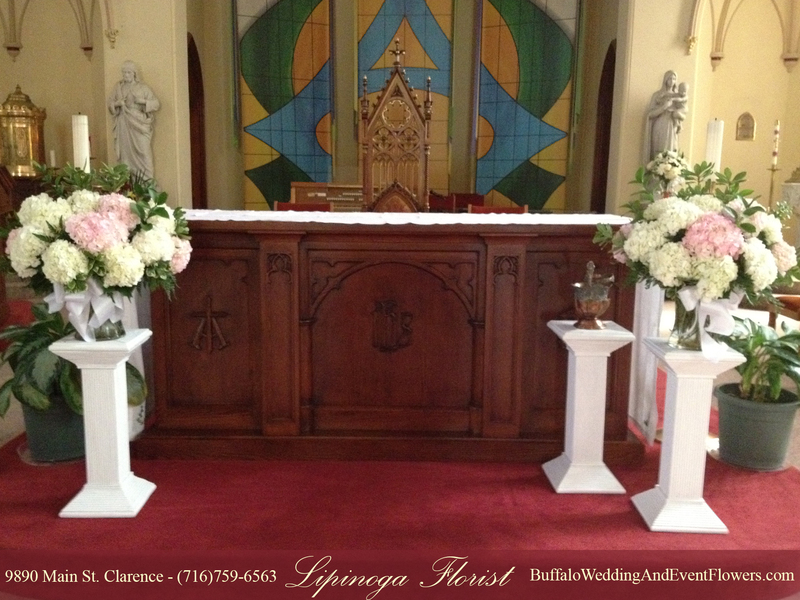 The shelves on the back altar held two matching arrangements in gold urns. 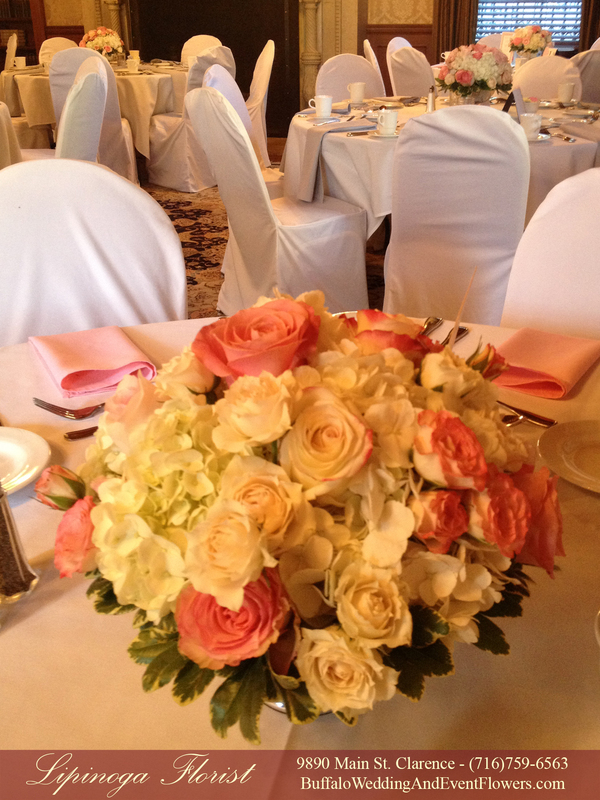 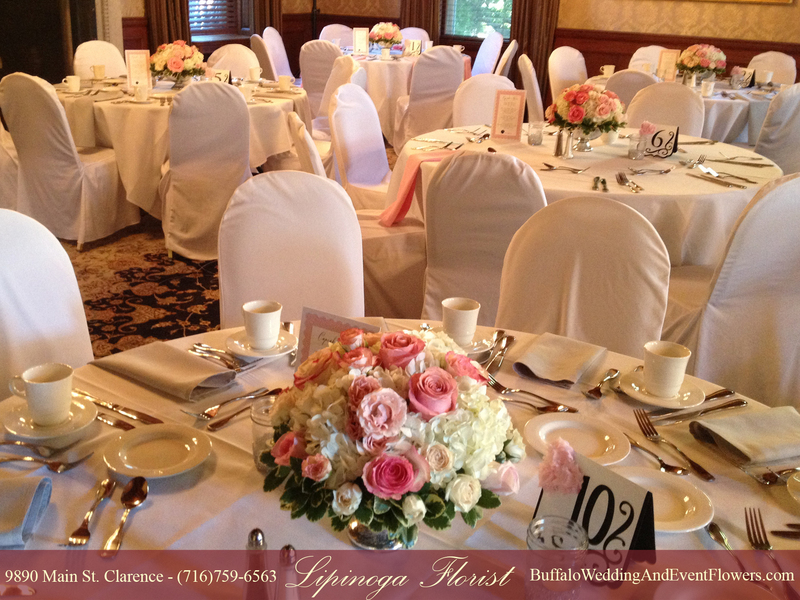 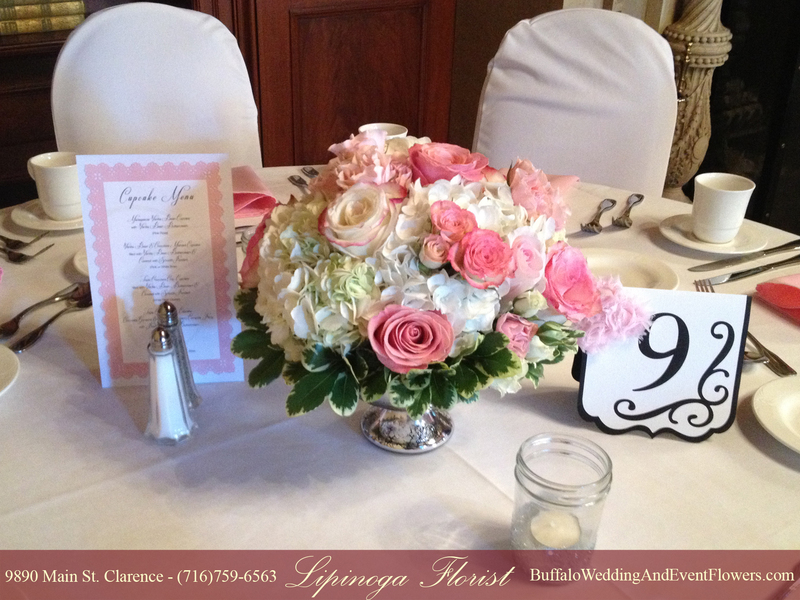 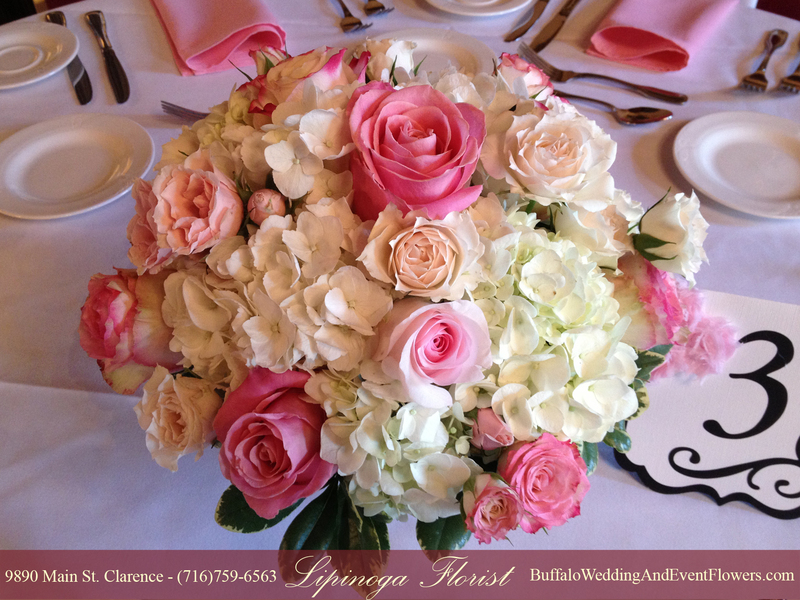 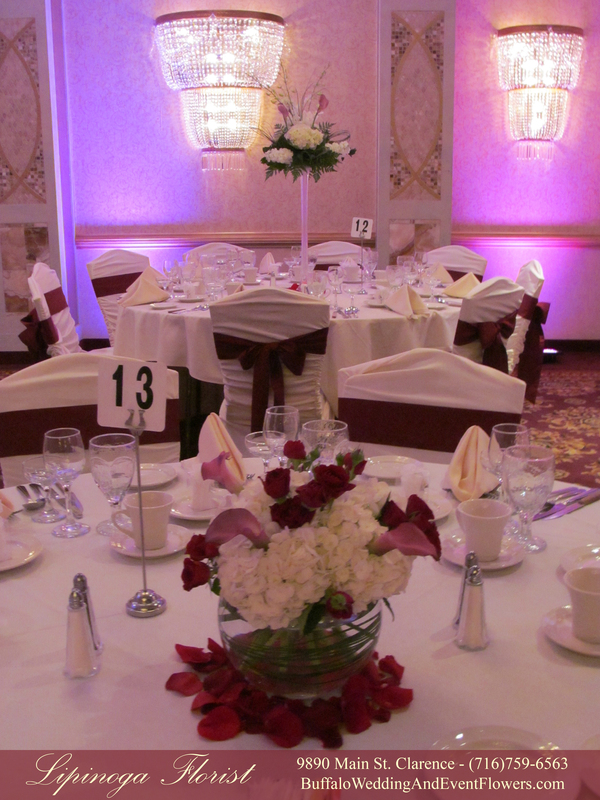 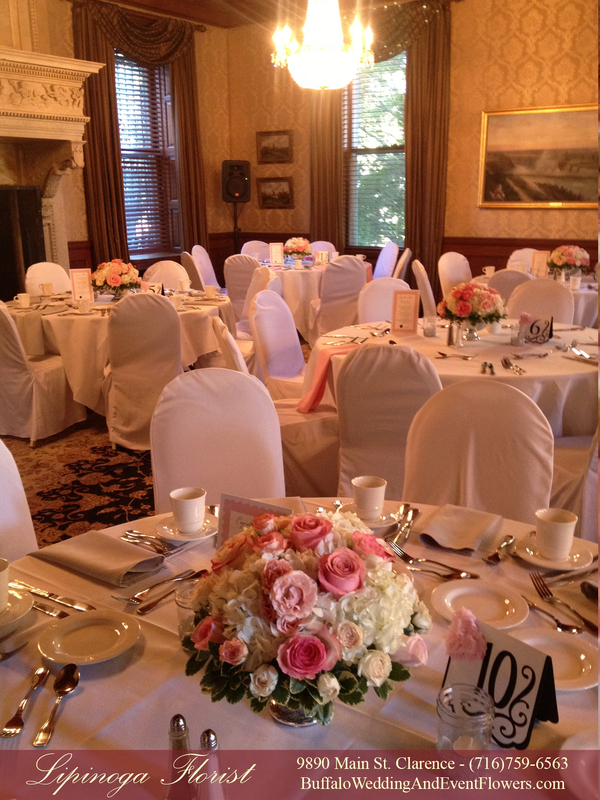 The wedding reception held at Salvatore’s Italian Gardens in Lancaster, NY included two styles of centerpieces. 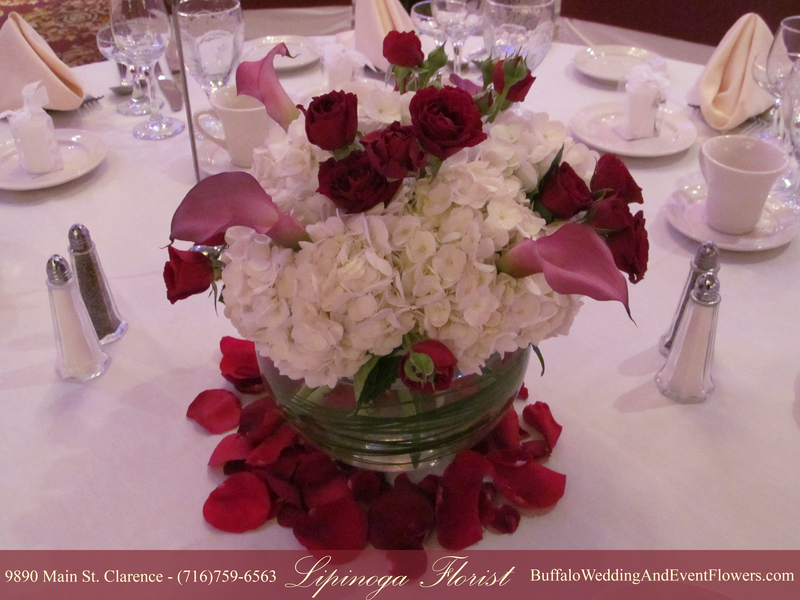 The low centerpieces arranged in glass bubble bowls included hydrangea, roses and calla lilies. 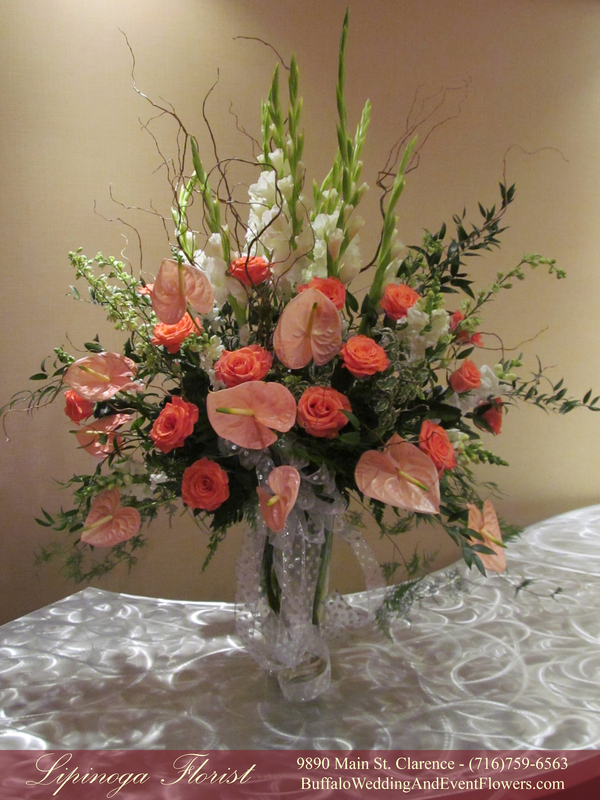 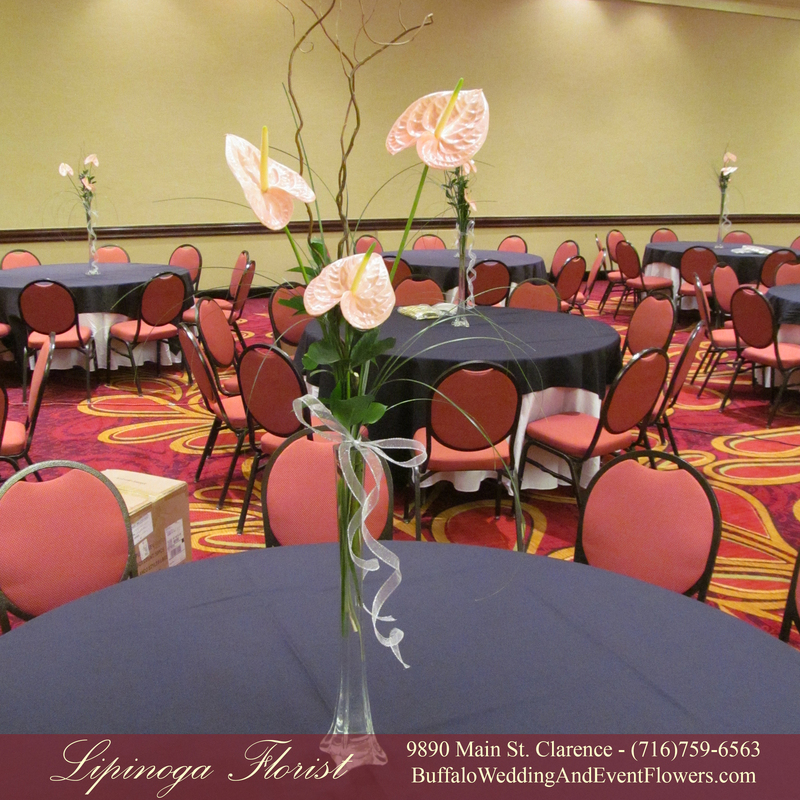 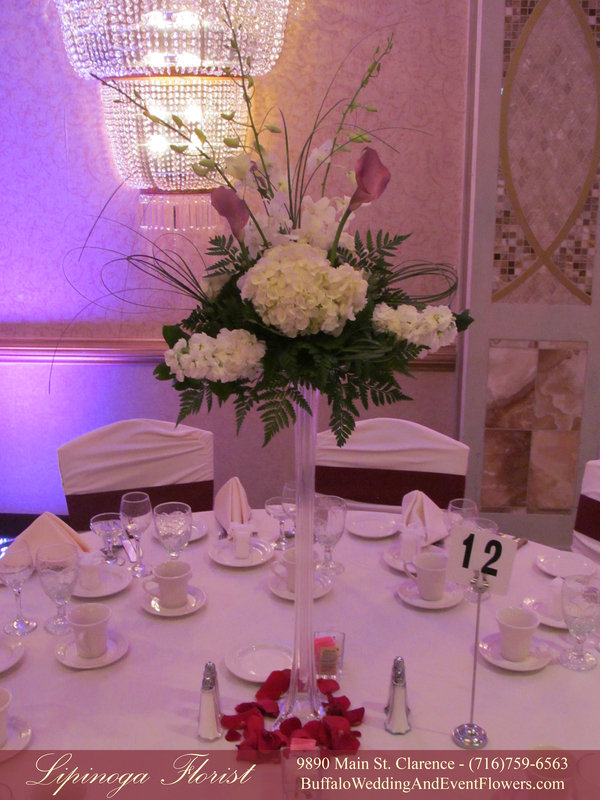 The tall centerpieces included hydrangea, orchids and calla lilies. 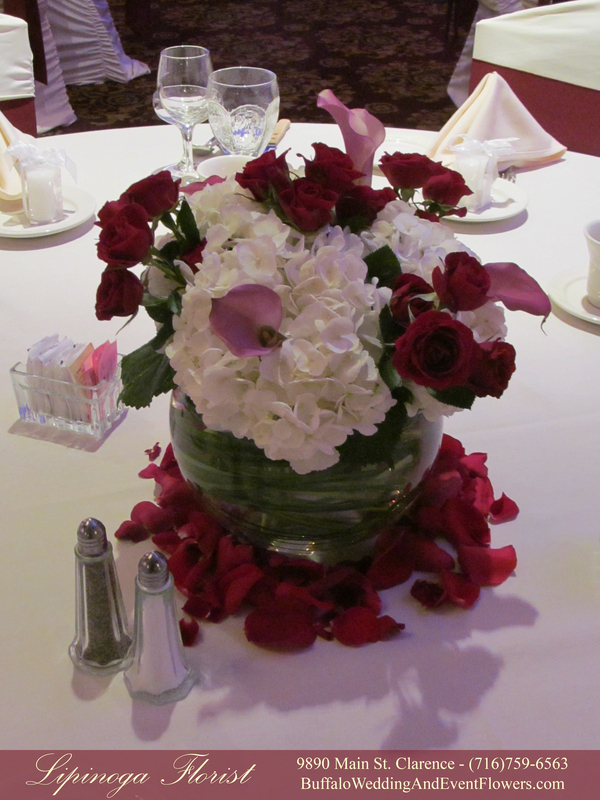 The elegant flower combination was accented by rose petals surrounding the centerpieces at the base adding a touch more color to the table. 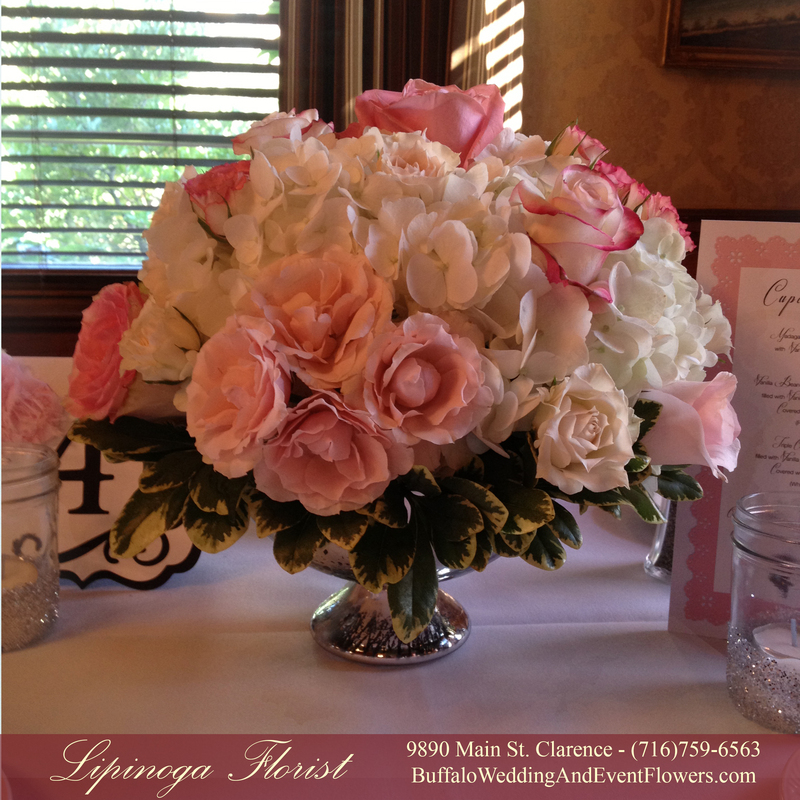 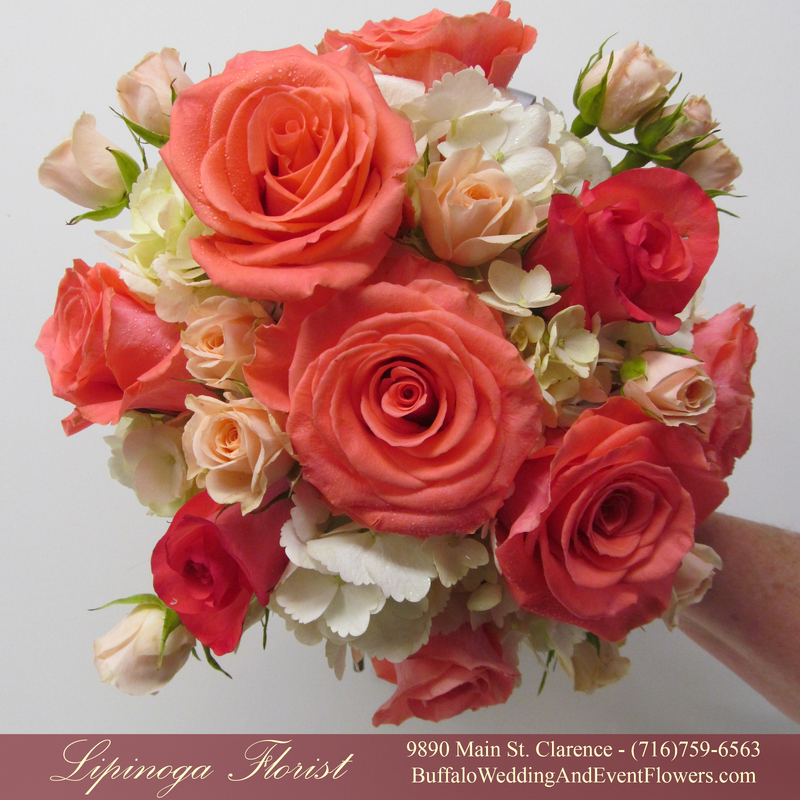 This wedding designed exclusively by Lipinoga Florist features many classic flower choices. 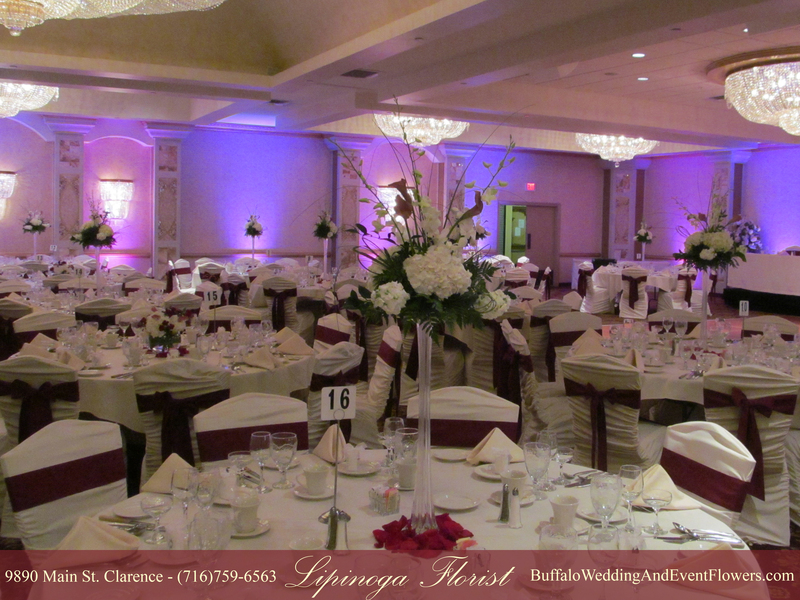 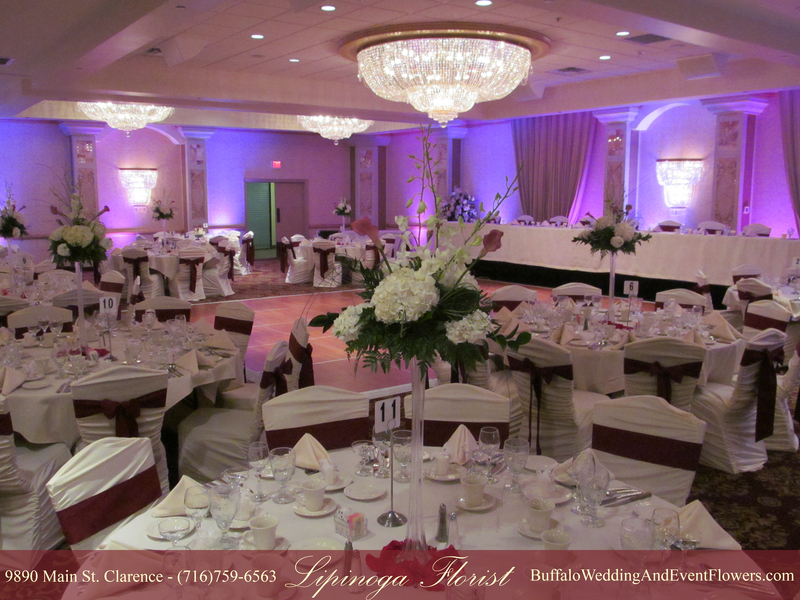 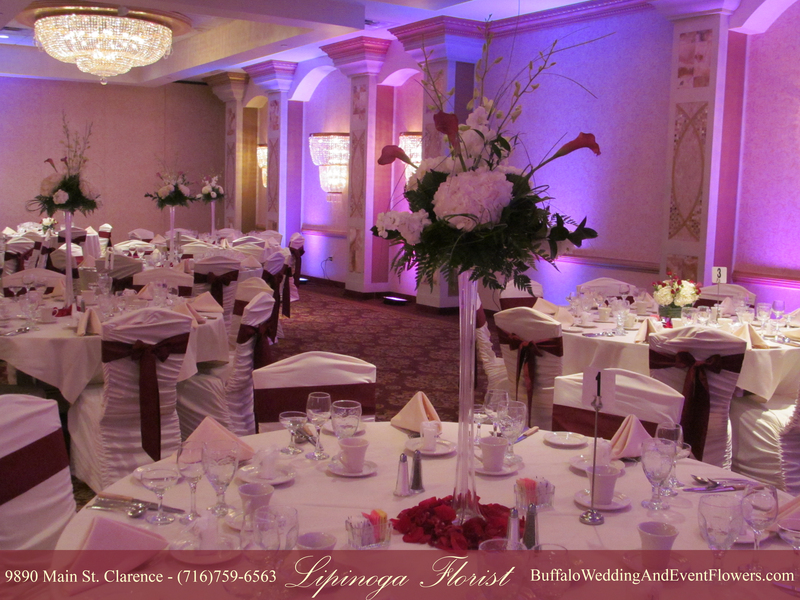 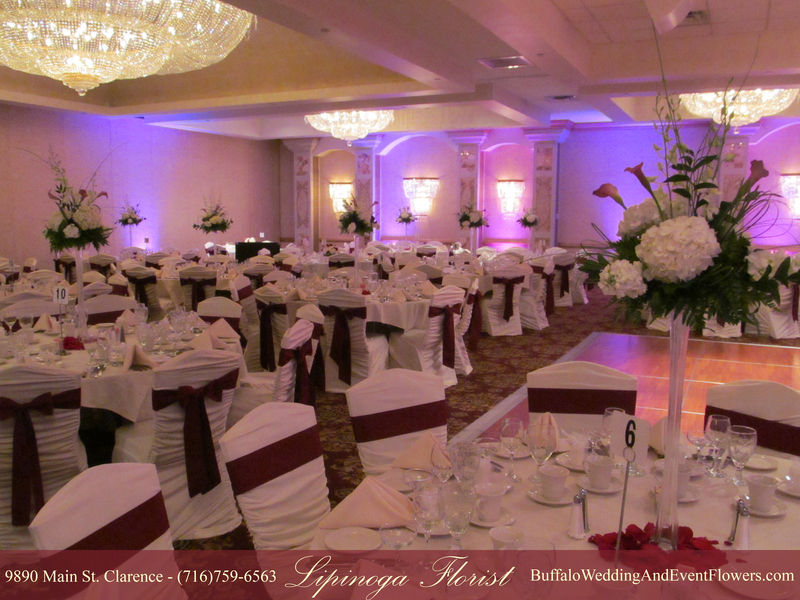 If you are getting married or holding and event and are inspired by what you see here or anywhere else on our blog please contact us at (716)759-6563 to schedule a personal consultation where we will tailor everything to suit your vision. 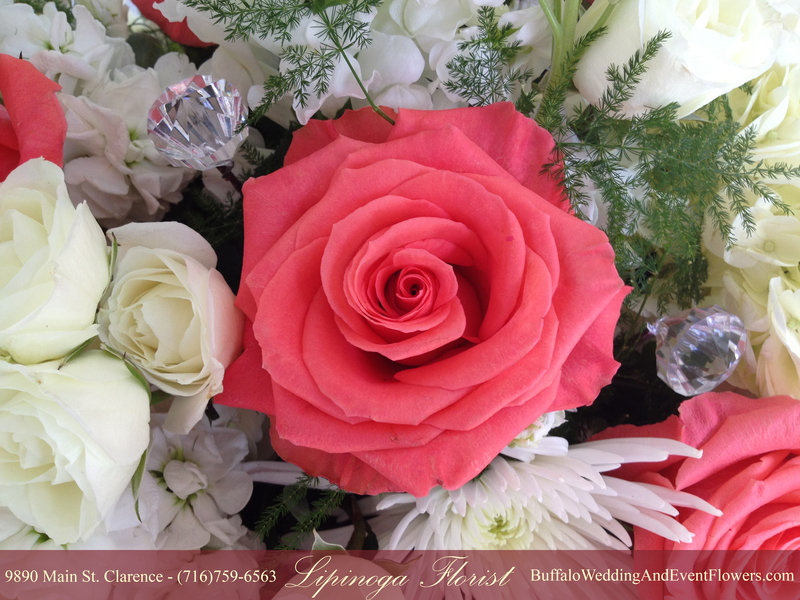 All the photos seen in this blog are of real weddings made and designed exclusively by the team at Lipinoga Florist.